TAKARAZUKA, HYOGO PREF. - Seventh-favorite Mikki Rocket picked up his first Grade 1 victory on Sunday at the 59th running of the Takarazuka Kinen, the first of Japan’s two “all-star” races each year. Mikki Rocket, steered by jockey Ryuji Wada out of the fourth stall, kept to the inside near the front of the mostly fan-voted pack at Hanshin Racecourse outside Osaka and accelerated around the final turn, crossing the line in 2 minutes, 11.6 seconds and edging Hong Kong-based Werther into second place by a neck. “It’s been a long time (since I won a G1 race), but we had a good position and the going was dry, and he responded well even as we went into the final stretch. I’m really happy,” said Wada, whose second Takarazuka Kinen victory was also his first G1 win in 17 years. The 5-year-old King Kamehameha-sired horse, who finished sixth in the race last year, picked up ¥150 million (about $1.35 million) in prize money for winning the 2,200 meter turf event, the last G1 race on the calendar until the Sprinters Stakes in late September. 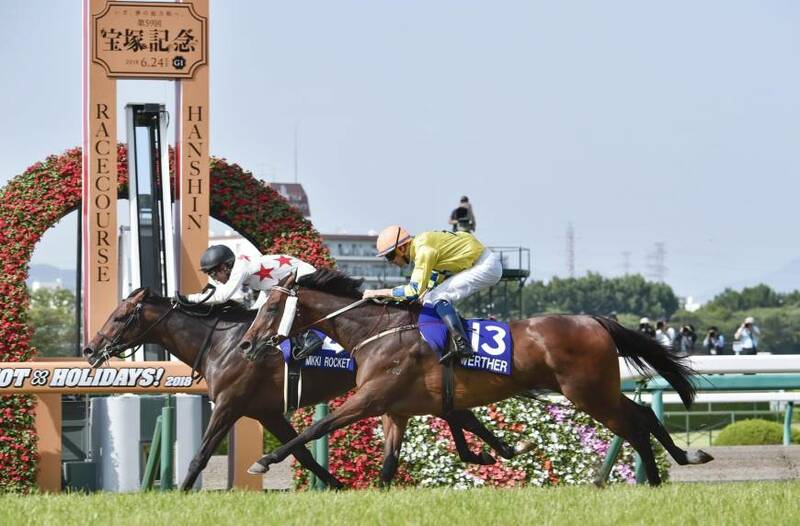 Werther, a 6-year-old New Zealand-bred gelding ridden by Australian Hugh Bowman, nearly won his Japan debut in a late dash. Werther was only the second foreign horse and first in 21 years to run at the Takarazuka Kinen. Twelth-favorite Noble Mars finished third, three lengths behind Werther, while race-favorite Satono Diamond, ridden by France-born Christophe Lemaire, finished sixth. Last year’s winner and sixth-favorite, Satono Crown, was 12th.